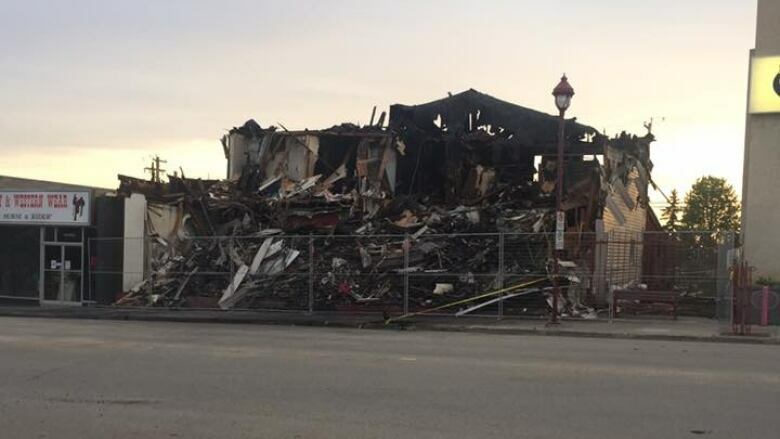 The town of Edson lost another piece of history Tuesday to a fire that destroyed the second-oldest building downtown. The blaze broke out at about 8:45 a.m. in a building that housed shops at street level and apartments above. Many of the town's 38 volunteer firefighters responded and soon got help from nearby Yellowhead County and Hinton. No injuries were reported but the building was gutted. Firefighters kept the flames from spreading to the western wear store on one side and the local radio station on the other. "There's no coming back from that kind of damage," said Shari McDowell, who runs the local Galloway Station Museum. "It's disappointing for sure. No one wanted to see that building burn up." McDowell said the building has been around since about 1920 and had undergone recent renovations. "We do the best research that we can, but we believe it's the second-oldest building that exists on Main Street," she said. "The oldest being the old Oddfellows Hall that's a little bit down the way. "There have been a lot of fires in Edson's history," said McDowell, whose museum houses the Edson and Area Historical Society. "Really, those were the only two buildings on Main Street that have survived. So it's really sad to see it go." Edson resident June Jinkerson had just parked behind the bank Tuesday morning when she saw the building across the street on fire. Other people were recording videos of the blaze and she grabbed her phone to do the same. "Everybody was outside," said Jinkerson, who has lived in Edson for the last nine years. "I'm surprised they even went outside because of the smoke. I mean, it was horrendous." "Even where I was standing, there were times that I couldn't even see across the street. It floored me. I haven't been that close to a fire since I was a child." While onlookers videotaped the fire, firefighters worked frantically to prevent the blaze from threatening buildings on either side. Jinkerson braced herself against a wall and recorded the action for nearly 45 minutes. Eventually she had to stop because her phone died. She credits the firefighters for getting the flames under control. "The firemen in this town were just amazing," she said. The town's website included an update on the fire Wednesday and a notification about water conservation. Fighting the fire used up so much water that all non-essential water services will be closed this week. Residents have been asked to conserve water, including not watering lawns until further notice.